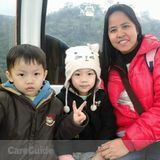 Hi im ana liza from philippines......37yrs old married and have 2 daughter..... kind,trustworthy and hard working person.I have four years experience as nanny.I presently residing in taiwan..... nice fun and loving nanny.I think working in Canada is big opportunity. Part-time mother's helper and Summer Camp 2019! Qualified and Dependable Nanny You Can Trust.